The Newman Educational Society, the Educational wing of the Diocese of Miao, takes a noble step to promote green, on the concluding day of its Annual Inter-School Cultural Fest, RADIANCE 2013, held at Divine Word School, Roing from 20 to 22nd October, 2013. Keeping in mind the importance of saving trees and planting more trees, the Diocese of Miao has decided to give a sapling instead of flowers to the Chief Guests and invitees of any of the programmes it organizes to promote green. 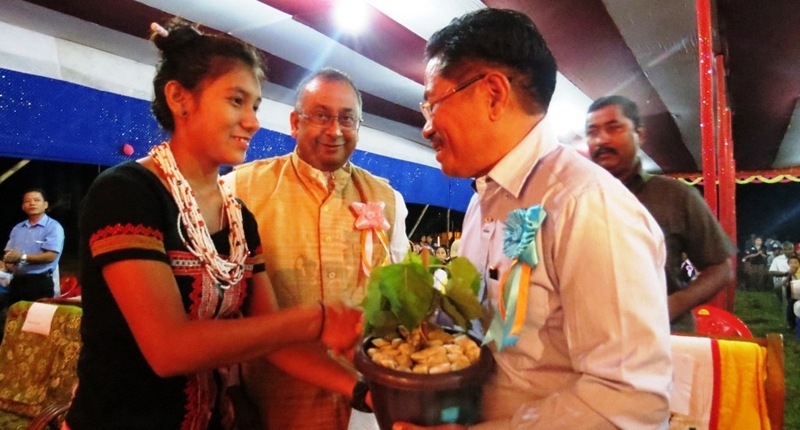 It began this noble step on the concluding day of the Annual Inter-School Cultural Fest, held at Roing , by giving a Sapling to the Chief Guest Sri Newlai Tingkhatra, Hon’ble Minister W.R.D/WCD, Government of Arunachal Pradesh. The Minister expressed his great happiness over this noble step taken by the Diocese of Miao to promote green and requested everyone to follow this example to save tress and plant tress. He also congratulated Bishop George Pallipparambil SDB, the President of the Newman educational Society for coming up with this creative concept to promote green.